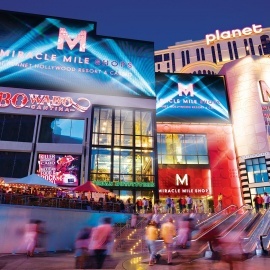 Miracle Mile Shops at Planet Hollywood Resort and Casino is a premier shopping destination in Las Vegas, Nevada. Located in the heart of the famed Strip, the mall offers more than 170 fashion clothing stores, 15 restaurants and live entertainment. 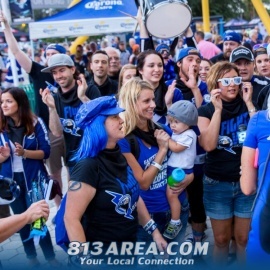 The center boasts several flagship stores and restaurants that are favorites among locals and tourists alike, including PBR Rock Bar & Grill, H&M, Cabo Wabo® Cantina, Victoria's Secret, Nacho Daddy, Sephora, Buffalo Wild Wings, GUESS, La Salsa Cantina, Steve Madden, Lobster Me, BCBGMAXAZRIA, Lombardi's Romagna Mia, bebe, Pampas Churrascaria Brazilian Grille, Drybar and more! The best in Vegas entertainment can also be found inside the Saxe Theater and V Theater, featuring a dozen shows daily including V- The Ultimate Variety Show and Vegas! The Show. 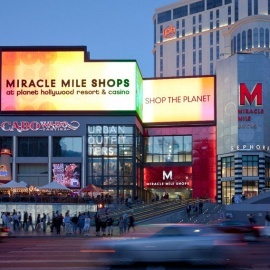 Keep up with the latest Miracle Mile Shops news via Twitter (https://twitter.com/MiracleMileLV) and Instagram (http://instagram.com/miraclemilelv).